The Edmund's Log Cabin is one of the Lincoln Log kit homes that was built about 12 years ago. 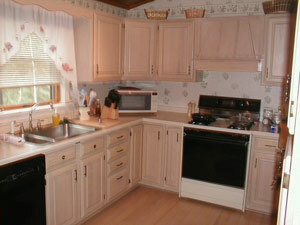 It features a very large rear deck with a screened gazebo. 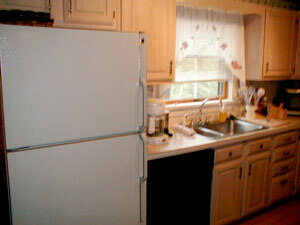 There is also a good sized gas grill for those that love to cook out summer or winter. The living room is medium sized with a 34" television. 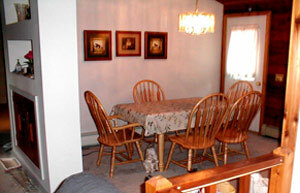 The dining area has a light colored table and six chairs. The lawn is level for playing games. The driveway is level for winter use and one garage is available for your car. There is nothing like going to a ski area in a warm car. The town of Chester has Dynamite ski area is a mile away for evening skiing. Gore Mountain is 15 miles away in North Creek. This is less than 20 minutes on two rural highways. For summer visitors Lake George Village is less than 30 minutes away. 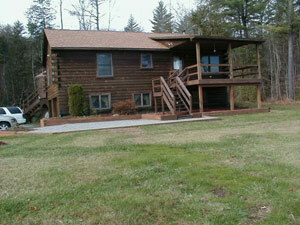 This home is located 2 miles from exit 25 of the Northway (I-87). 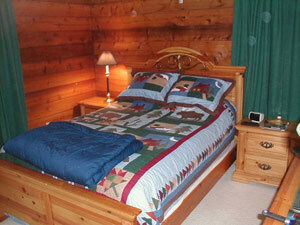 The master bedroom has a queen sized bed with a color TV and private bathroom. 2nd bedroom has a queen bed with a color TV. 3rd bedroom has a double futon and color TV.